"Teacher with 2 jobs finally finds the support, encouragement and community she needed to keep her motivated in achieving her goals!" I started going to Pursuit around Thanksgiving and was quickly hooked; the workouts were challenging, but kept me engaged. 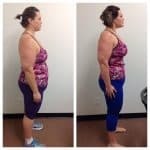 I actually lost weight during the holidays, and then I heard about the transformation contest. I decided to enter and fully commit to shedding some major pounds. Staying dedicated wasn’t easy; I teach middle school and have a retail position on top of my family obligations. But everyone at the gym is so encouraging and enthusiastic! Adam was my coach, and was a fantastic person to check in with and get feedback about whatever challenge I was currently facing (even if he did make me do bear crawls in personal training). Joe, Sarah and Ryan were great supports, sources of accountability, and cheerleaders too! But I think the part that was the most amazing was how supportive everyone was at workouts. So many people were willing to give positive and uplifting comments, advice, and encouragement. I can’t count the number of times where I showed up and was ready to just put in my time and go home; but then the people and the positivity reminded me of how blessed I was to have this opportunity. It really pushed me to give that extra effort, use that next level up band wise, grab that heavier kettle bell, or even *sigh* finish all the burpees during Thunderstruck. So thank you ALL for being there for me- I wouldn’t have achieved this level of success or have a chance of winning this contest without you. I just hope that someday I’ll be able to pay forward the generosity of spirit that you’ve shown me!